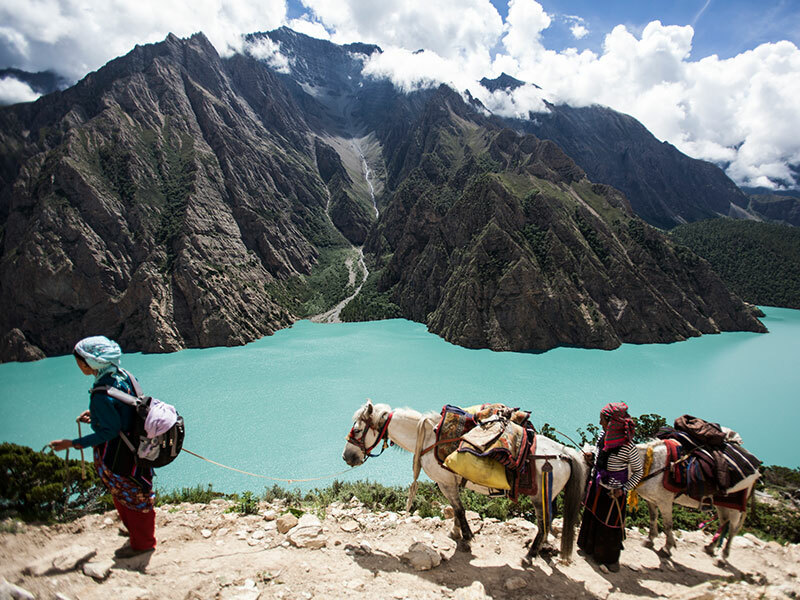 Dolpo lies in the western part of Nepal and most of its region are still unexplored. Norbung Kang Peak expedition is one of them. This trip has a lot to offer; Tibetan landscapes, magnificent mountain views, Phoksundo Lake and most of all abundance ofalpine wilderness with adventure. Explore the wilderness of Upper Dolpo Region. Fascinating Mountain View along the trails and crossing 5000 M+ high passes. Today morning you are transferred to Domestic Airport for the flight to Nepaljung which takes approx. 1 hr. Upon arrival at the Nepaljung Airport, you are transferred to the booked hotel. Breakfast at the Hotel. Today we will fly to Dolpo which takes approx. 45 mins. Upon arrival at Juphal, we meet with our trekking crewsat the airport and head out to Raktang. From Raktang, we descend steeply out of Juphal through the terraced village of Dhagmara and cross the wooden bridge posts carved with shamanistic faces. After a few hours of walk we come to an Army Post after crossing the suspension bridge at the confluence of the Thuli Bheri and the Sulighat. From Sulighat we pass through small hamlet of Kalapuri then to Kageni and finally to Raktang. We continue our trek following the western bank of Suli Khola, passing through pasture lands. After two hours of walk, we come across a wodden bridge and further 3 hours walk lead us to our camp site at Chepka a small Tibetan settlement tucked away amongst the steep hill-sides. From Chepka we head to Amchi Hospital, crossing few wooden bridges on the way. We will stop at Rechi for Lunch. From Rechi, we trek for anotherhour or two to reach Amchi Hospital where we camp for overnight. Today we ascend towards thePhoksundo Lake and the village of Ringmo Village (3652m).Phoksundo Lake is regarded as one of the most scenic and beautiful lakes in Nepal. You can also see the Norbung Kang (6085m) peak on the right corner of the lake; our main destination. We continue along this high, sandy trail, descending slowly through a lovely forest of larches and birch. Day is at leisure. Today we explore around the Ringmo Village and head to Tshowa (the lake-shore Bon Monastery). The Gompa is nestledat a ridge top above Phoksundo Lake and was built about 900 years ago.Then we descend down to Phoksundo Lake along steep-sided cliffs. Today morning we start our trek from Phoksundo. After crossing the Phoksundo River we then descend down to Rike and head on to Yak Kharka commonly known as Bagala Base Camp. After breakfast, we start our trek to Danigar. We come across a bridge and walk alongside the Maduwa Khola to Bagala Phedi. En-route to Danigar we climb uphill along the shabby yak trail to Bagala Pass (5214m). From the top of the pass, we can see sacred chortens and Norbung Kang peak and other peaks looming in front of us. From Danigar we head to Norbung Kang Base camp which takes approx.5-6 hrs walk. We can only summit the Norbung Kang peak from base camp as there are no any specific camping place in between base camp and Norbung Kang. Today we follow the basic principle of Mountaineering, “Climb High Sleep Low”. We will explore around the base camp to get acclimatize and know the mountain better. Early morning we attempt towards the summit of Norbung Kang Peak. The views from the top of the summit is mesmerizing majestic Himalayan peaks on our head level. We then descend down to the Base Camp. After the successful summit to the peak, we trace down our tracks back to Danigar. From Danigar we trek to Numla Base Camp following alongside the river bank of Gyambho Khola. We then climb uphill to Numala Pass (5240m) on the rugged trail. From the top of the Numla pass, you can have a majestic view of Mt. Dhaulagiri, Churen Himal and Norbung Kang Pass as well. After crossing the pass, the trail is relatively easier. Today we descend down to Dho Tarap. Enroute we can see the dramatic Shering Gompa which houses the monks in the region. After further descend, we come to Tokyu and then to Dho Tarap. The trail towards Dho Tarap follows Thakchui Khola and soon we start to sight a settlement with small houses. There is a health post support by the project and also an Amchi Clinic (traditional healing practice) in Dho Village. Following the banks of Tarap Khola, we descend down to Nawarpani. At Langa we cross the bridge and then before heading to sisual, the trail ascends to another small pass. Beyond the pass, the valley widens dramatically, which is a sight to view. It is a straight downhill walk from Nawarpani to Tarakot. Enroute we come across few monasteries. After crossing the Thuli Bheri river on a wooden bridge further descend leads to Tarakot. Trek to Dunai (2140m). Approx. 7 hrs walk. From Tarakot, we climb uphill to Dunai. Dunai is quite a big mountainous town in Dolpo region which has local schools, health post, government offices, police station. From Dunai, we trek to Juphal following the southern bank of Bheri River and pass Roop Ghar with the water mill. Today we bid our farewell to our trekking crew members, collecting all memories of past 2 weeks. We then connect flight from Nepalgunj to Kathmandu. Upon arrival in Kathmandu, you are transferred to Hotel. Free day in Kathmandu. A cushion day incase if the Nepalgunj to Kathmandu flight gets cancelled. Day 12 : Reserve day. Day 19 : Trek to Dunai (2140m). Approx. 7 hrs walk. Day 21 : Fly Juphal to Kathmandu.